Unlock your talent at our Hibiscus Coast Talent Show called OTT (Over The Top). 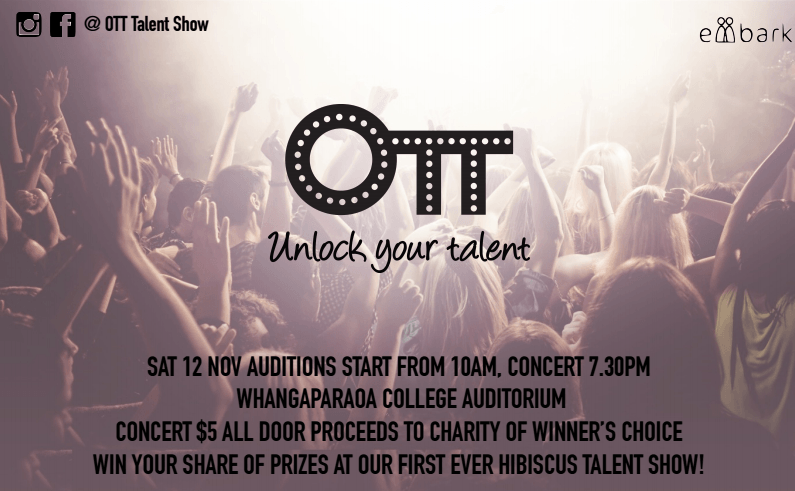 Do you have a talent you would like to share, well then come down to our Talent Show on Saturday the 12th of November at the Whangaparaoa College Auditorium, and be the first winner of OTT. The Show/Finals will start at 7:30pm. It's a community event and perfect for the family with raffles and spot prizes to be won. Come and watch the show. You can buy your tickets at the door . All door sales we raise will go to the Charity of the winner’s choice. You can choose a category consisting of Band, Dance, Singing, Open and ages of 5-12 and 13 and above. There will be cash prizes for first, second and third. Come with your family and enjoy our Show. See you there! For more information or registration visit our OTT Talent Show page on Facebook now or email us at nzembark@gmail.com.